NAFTA talks could turn sour as Canada files trade complaint against U.S.
WASHINGTON — Prepare for a tense moment in Canada-U.S. relations — with hard bargaining on NAFTA on the horizon prompting nervous glances at Donald Trump to see whether he cancels the agreement, now compounded by a bitter, wide-ranging trade dispute. Canada launched a broad attack against American trade practices in an international complaint about the superpower's use of punitive duties, eliciting a caustic counter-swipe from the Trump administration when the document was made public Wednesday. "(This is an) ill-advised attack," U.S. trade czar Robert Lighthizer said. "Canada's claims are unfounded and could only lower U.S. confidence that Canada is committed to mutually beneficial trade." Two weeks from now, the unstated backdrop to the dispute will be squarely in the foreground. The countries will gather in Montreal for a high-stakes round of NAFTA negotiations, with no additional talks scheduled beyond March. Canadian officials say they know full well that Trump could invoke NAFTA's withdrawal clause during this January-March period. What would happen then? For starters, the Canadian dollar and Mexican peso would take a quick plunge, just as they did Wednesday after news reports emerged saying the Canadian government is more convinced than ever that Trump is poised to invoke NAFTA's withdrawal clause, perhaps around the time of the talks in Montreal Jan. 23-28. Two Canadian government sources insist that's not true. Rather, they say there are different points of view within the Canadian government about whether Trump will pull the plug — as he's repeatedly threatened to do — and, if so, when. One official said the current uncertainty could last several months, or even longer: even if Trump issues a withdrawal notice, the agreement provides six months before a country can actually leave. Some U.S. observers also predict court fights over whether a president can abandon a trade deal without congressional approval. Speaking of court fights, more are on the way. Canada has launched a World Trade Organization complaint about the U.S. system for imposing punitive duties, alleging that they violate international law. The complaint was launched in December but made public Wednesday — the very day, coincidentally, that the U.S. announced its latest trade action against Canada. The U.S. is imposing duties of up to nine per cent on Canadian paper, following similar penalties against Bombardier and softwood lumber, over what the U.S. alleges to be unfair Canadian trade practices. Canada is now arguing that the entire American process for imposing anti-dumping and countervailing duties violates global trade rules. It cites five reasons, saying the U.S. levies penalties beyond what's allowed by the WTO, improperly calculates rates, unfairly declares penalties retroactive, limits evidence from outside parties, and has a tilted voting system in domestic trade panels that, in the case of a 3-3 tie, awards the win to American companies. The complaint holds global consequences. Canada cited 122 cases where the U.S. unfairly imposed duties on foreign countries, not just Canada. "It's (saying), 'The entire way in which the U.S. — you — are conducting your anti-dumping, countervailing procedures, is wrong,"' said Chad Bown, a trade expert at Washington's Peterson Institute and host of the podcast "Trade Talks." "This is effectively Canada bringing a dispute on behalf of all exporters in the world — the Europeans, Japan, China — because they're making a systemic challenge." Some critics questioned the timing. 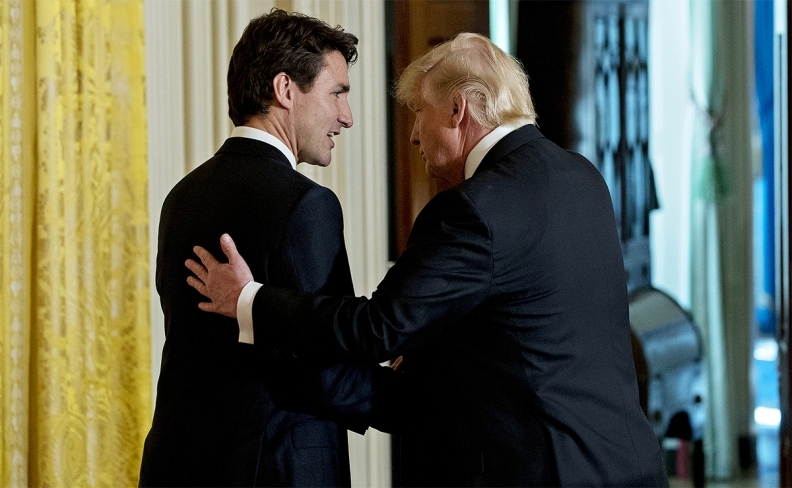 Edward Alden of the Council on Foreign Relations called it a precarious moment for NAFTA and the global trading system, both of which are under threats and criticism from Trump: "Canada has just detonated a bomb under both." Canada-U.S. trade lawyer Mark Warner said Canada is well within its rights to take action on complaints that may have merit. But he questioned the strategic logic of antagonizing the Trump administration on the cusp of the potentially pivotal Montreal talks when it's already unhappy with both NAFTA and the WTO. "This isn't going to calm passions in Montreal," Warner said. Indeed, the Trump administration wasted no time expressing its displeasure. In a statement, Lighthizer not only criticized the move but said it was self-defeating for Canada, too, since if it succeeds, low-cost producers could start dumping product onto the U.S. market, squeezing out Canadian competition. "The flood of imports from China and other countries would negatively impact billions of dollars in Canadian exports to the United States, including nearly US$9 billion in exports of steel and aluminum products and more than $2.5 billion in exports of wood and paper," he said. "Canada's complaint is bad for Canada." The smaller northern neighbour could be making a point about NAFTA, he said: that if Canada loses free trade, and its dispute-settlement bodies, it will use international means to fight its battles.